After five days of birding in southeast Florida, it was time to pick up Kitty in Naples on Friday, April 17. Several weeks before the trip, I learned about the American Flamingos that had been discovered several years ago in Stormwater Treatment Area 2 (STA 2) in Palm Beach County. This year, for the first time, birders were being allowed access to the area through the Audubon Society of the Everglades. 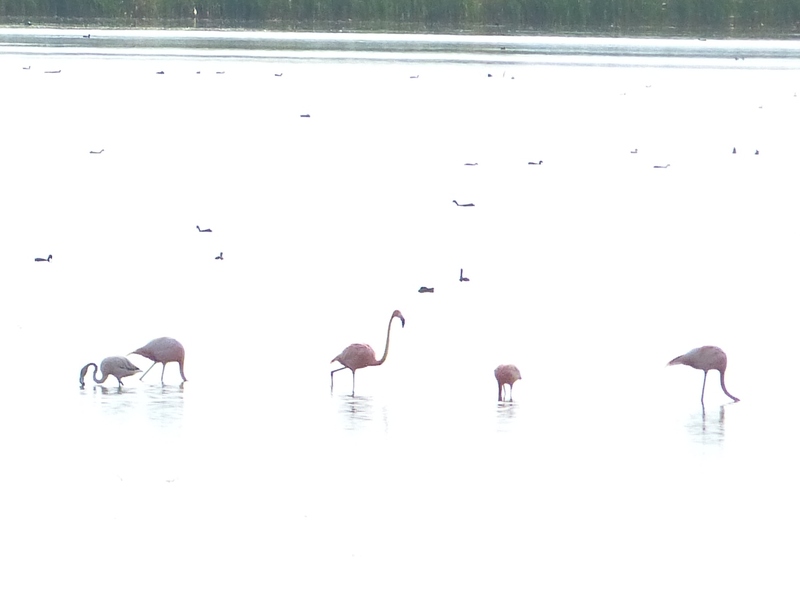 Wild flamingos are difficult birds to see. Even if one is willing to brave the heat and mosquitoes, Snake Bight in no longer a reliable option. 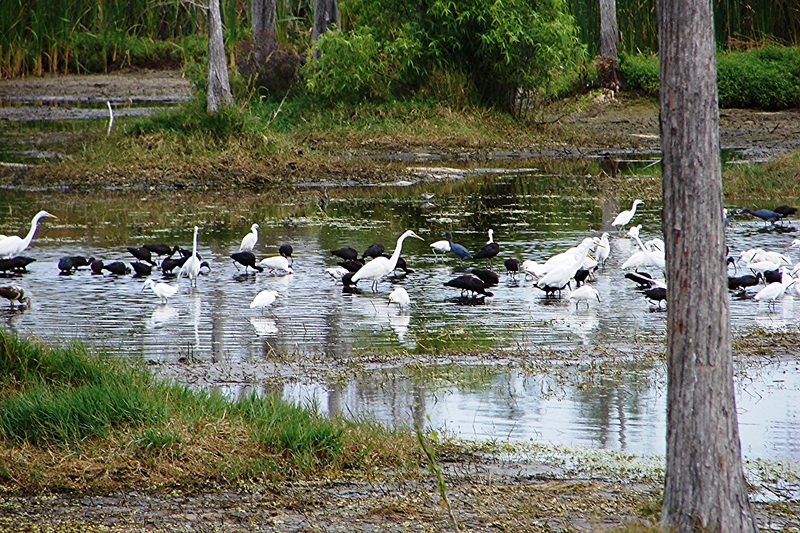 When the birds sporadically show up in the Everglades, a boat is usually required to get to them. So, the STA 2 birds represented a unique opportunity. The only problem was that space on the scheduled trips was limited and many more people wanted to see the birds than there were spaces available. We were on the waiting list for Saturday, April 18. We had been told that if we made the cut, we would be notified two days prior to the trip, but in my mind I had set the cut-off time as noon on Friday. Everything went smoothly on Friday morning. I picked Kitty up at noon and after a quick stop at Eagles Lakes Park, we headed north. Eagles Lake Park, Naples, on my first visit in 2007. We planned to drive through central Florida and spend the night in Winter Haven. Kitty had a fabulous Everglades trip and I enjoyed hearing about it as we slowly made our way north. We stopped for a late lunch/early dinner at Beef O’Brady’s in Arcadia at about 4:00 PM. While waiting for our food to arrive, I checked my email and there it was – a message that we were in for the Flamingo trip! 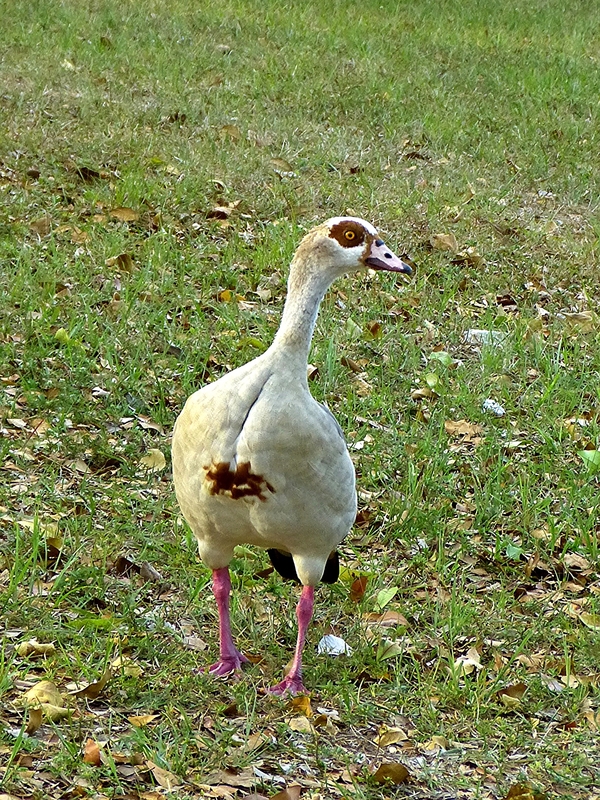 I was caught by surprise and disoriented about where we were and where the flamingos were. 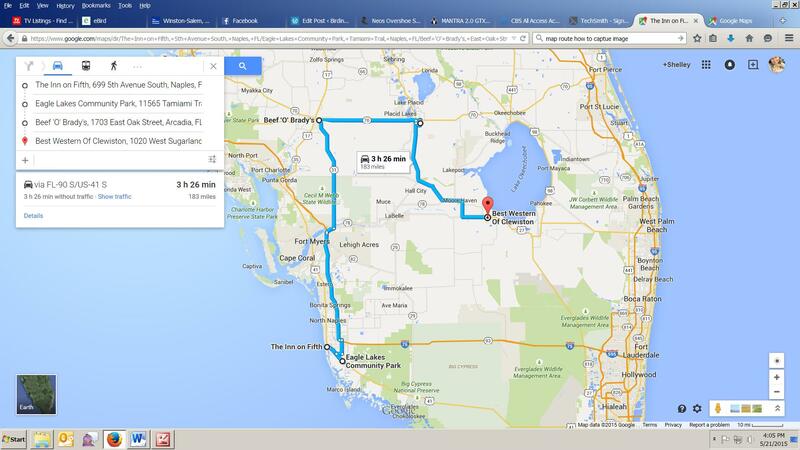 The exact location had been kept secret from us, but I knew that it was about 40 minutes from Clewiston. Kitty calmly looked as a map and simply said, “We can do it.” So, we quickly replied “Yes” we will be there, cancelled our motel reservations, made new reservations for the night, and headed east. State Road 70 seemed familiar to me. I was pretty sure that this was where David and I had found our lifer Crested Caracaras back in 2008, so I suggested to Kitty that she look up Crested Caracara in the Peterson field guide. 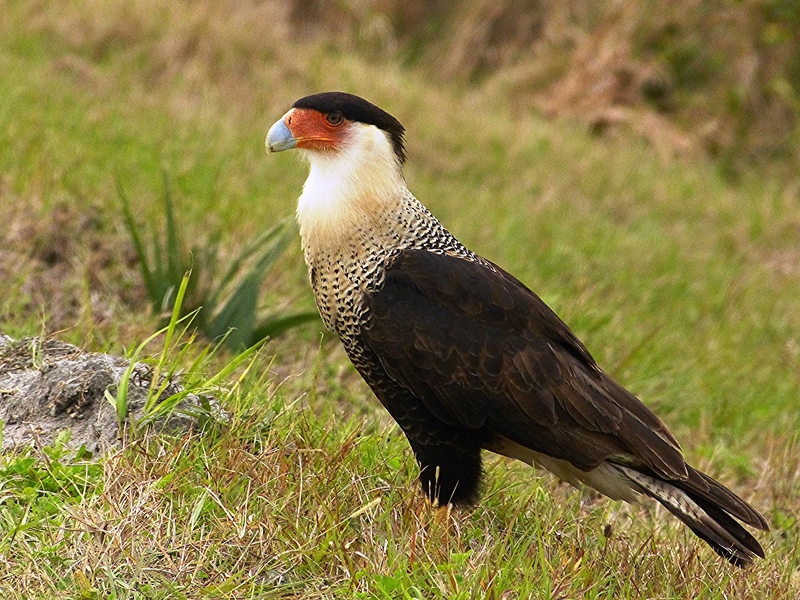 A short time later, Kitty found her own Caracara and then two more. The next morning I went to breakfast at the Best Western in Clewiston and saw two people who looked like birders. So, I took a chance, walked over and said “Good morning. Are you birders?” Yes, they were. Bill and Lena from Corvallis, Oregon and I chatted a few minutes and then I hurried to get ready for the drive to STA 2. We arrived half an hour early, but were still car #7. Car-pooling is strictly enforced for these trips and we were happy to have two rather new birders ride with us. The leaders didn’t waste any time after approximately 60 people were checked in. We drove the 7 miles to the area where the flamingos were usually seen as fast at the dirt roads allowed. Before we even stopped, the leader announced on his walkie-talkie that he saw the birds. Next I heard “They’re flying.” But before my heart sank, “They are coming closer!” Five American Flamingos were then feeding so close that we could see them without binoculars. With a scope, the view was wonderful. Yet they were far enough that we didn’t disturb their feeding. We enjoyed watching as they stood on one leg and stomped with the other foot to stir up food from the bottom of the shallow water. They completely submerged their heads under the water to feed. Fascinating details about Flamingo diet and feeding behavior can be found here, here, and here. The group consisted of serious birders, casual nature lovers, and everyone in between. There was mutual acknowledgement that this was special and we all shared the joy of the experience. The STA 2 trip lasted from 9:00 AM until 1:00 PM. We drove 20 miles on the dirt berms and enjoyed many other birds in addition to the flamingos – Black Skimmers, White Pelicans, Black-necked Stilts, and more. Seeing the flamingos would have been a wonderful end to the trip, but we were not quite ready to head for home. Merritt Island National Wildlife Refuge was our next destination and the Quality Inn in Titusville was the logical place to spend the night. Early the next morning, I went to breakfast and who did I see? Yes, Bill and Lena from Oregon again! The four of us enjoyed breakfast together and then Kitty and I headed to Merritt Island. It was MUCH quieter than when I’d been there in January, but Kitty and I are both easily amused and never fail to find something interesting. That morning it was the Red-breasted Mergansers cruising with backs raised and heads under water so that they looked more like mammals than birds. Kitty speculated that the water was too shallow for diving and back home that theory was confirmed. 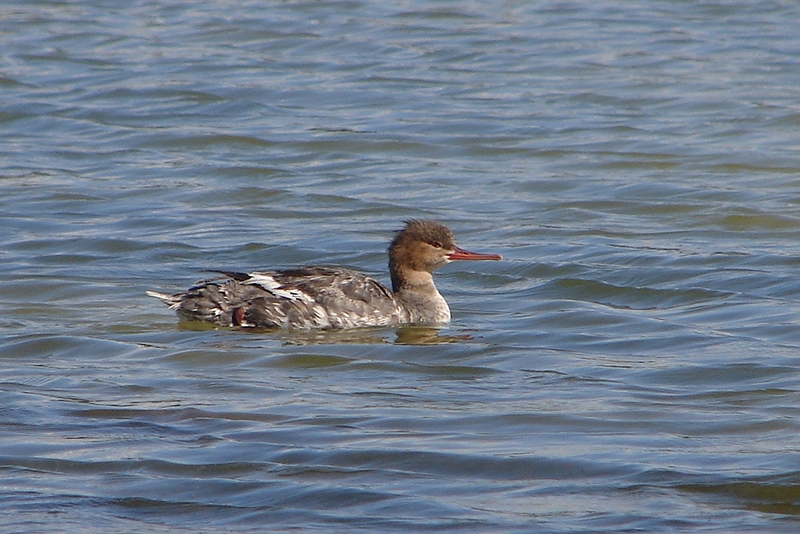 My life Red-breasted Merganser from Honeymoon Island in 2007. Our last stop of the trip was the Audubon Center for Birds of Prey in Maitland. It’s a very nice facility with all the native raptors of Florida. We especially enjoyed close-up looks at the Kestrel and Merlin. It was hot and our energy was running a little low on this day 11 of our travels. So, happy and tired, we headed for home. 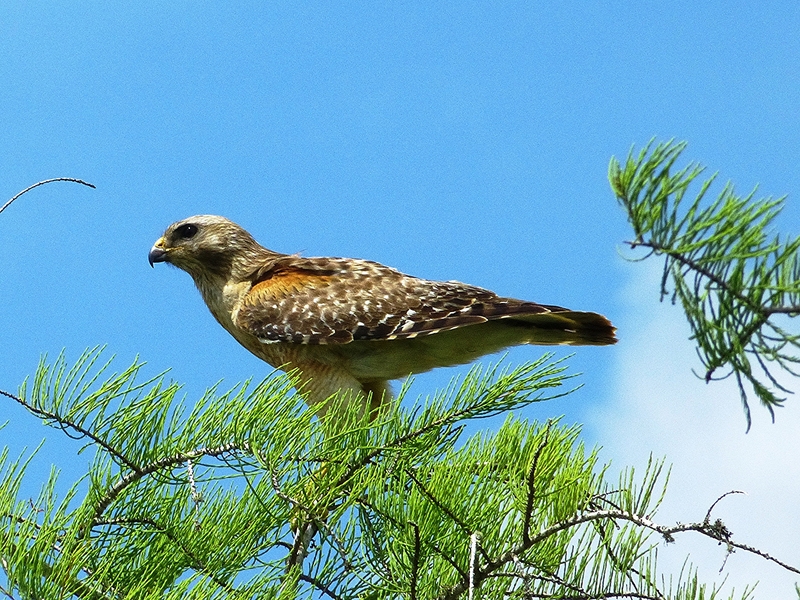 Red-shouldered Hawk, a common Florida raptor observed earlier in the trip in Everglades National Park. While nothing was as exotic as Asia or South America, this was one of my favorite trips ever. Sharing much of it with friends made it even better. Part of me will always be a Florida girl and I am excited to think about the adventures that still await me there. 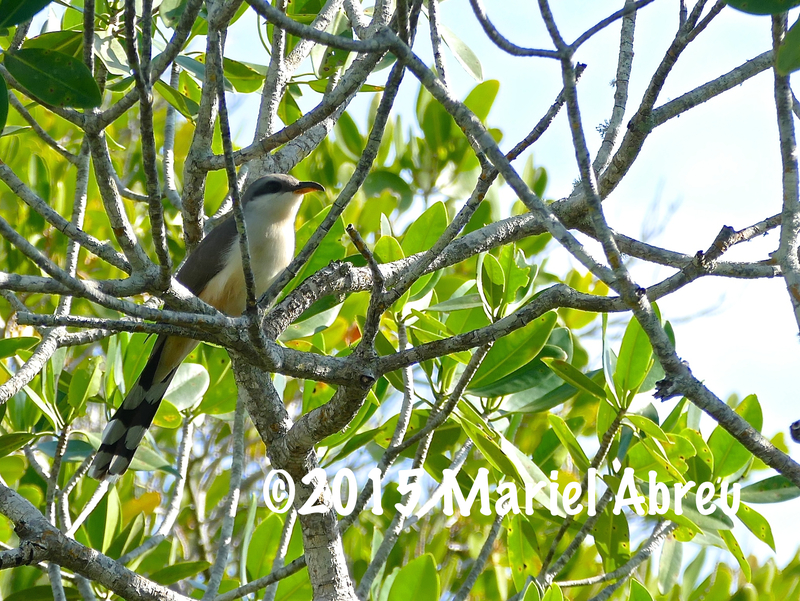 On Tuesday morning, April 14, I headed off to Dagny Johnson Key Largo Hammock Botanical State Park to look for a Mangrove Cuckoo. I dipped on the cuckoo, but found a gazillion White-eyed Vireos. Well, maybe that count is exaggerated a bit, but not much. The only other bird as numerous at Dagny is Northern Cardinal. After searching fruitlessly for a couple of hours, I decided to head to Long Key State Park. My late husband, Burt, and I frequently camped at Long Key in the early 1980’s, so it holds many fond memories. 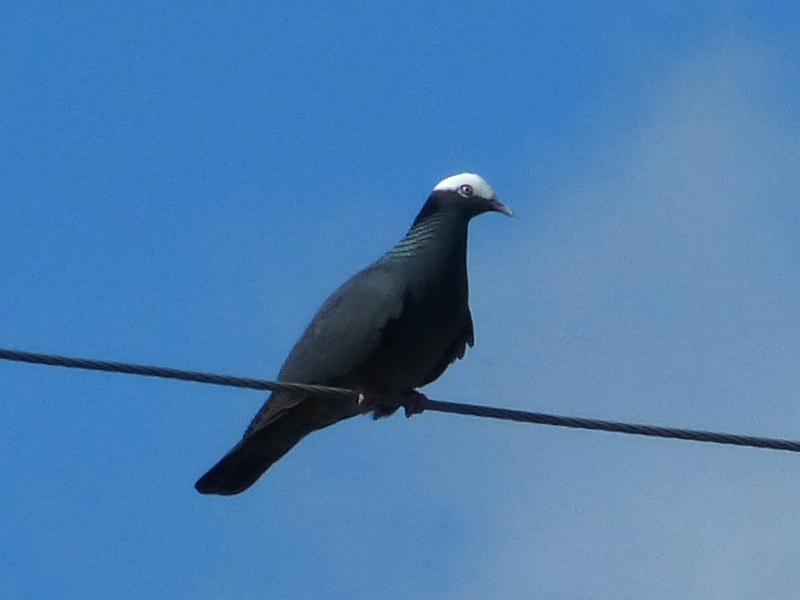 Plus, I could get lucky and find a Key West Quail-Dove. Could get lucky, but I didn’t. I found only two birds – a Prairie Warbler and a Red-bellied Woodpecker. It was the wrong time of day, but at least I had tried. I went back to Dagny Johnson for another attempt at finding the cuckoo. I dipped again, went to my motel, and sent Angel and Mariel a note about my failure to find the cuckoo. 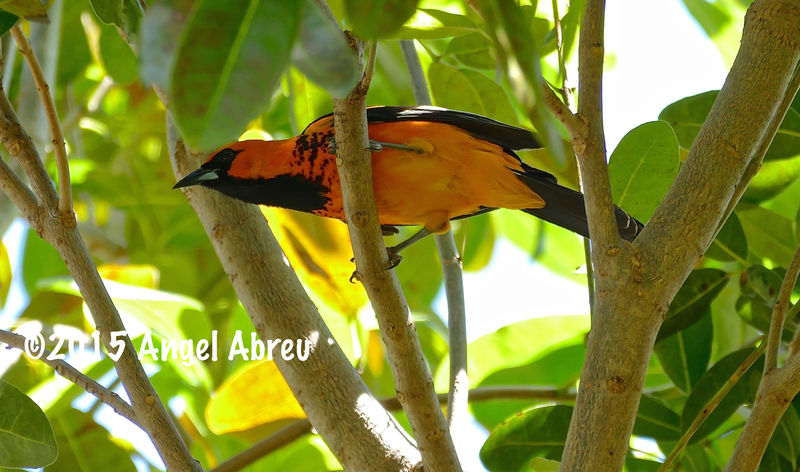 Angel and Mariel Abreu operate “Nature Is Awesome,” a birding and wildlife tour company, and I would be going out with them on Thursday. I quickly received a reply with specific directions to where the cuckoos are usually found at Dagny. White-eyed Vireo. Photo by Andy Reago. I really wanted to find the Mangrove Cuckoo on my own rather than have someone show it to me. Even though I had only looked for it once before, it had been one of my most wanted birds for years. And, now I had one day to find it for myself or Angel and Mariel would find it for me the following day. I went to the spot at Dagny that they described and got nothing. So, I walked around for an hour and then went back to the same spot. I played the call. And, the bird answered! First I heard it to the right and then to the left. And, then it perched right over me and I got a great look. I was just numb with disbelief. I watched until the bird moved and then I stepped out into the open circle where the paths converge. And, now the cuckoo was out in the open! This was one of the happiest birding moments of my life. I didn’t get a photo, but here is a shot of a Mangrove Cuckoo that Mariel Abreu got earlier in the year. I slowly walked back to the car and met Ottawa birder Paul Lagasi as I was about to leave the park. Paul also has a blog, BIRDQUEST2004, which is a showcase for his gorgeous photos. His accounting of this part of the trip is here. Paul wanted the cuckoo as badly as I had. This was his seventh attempt to find it. So, of course, we went back and attempted to relocate the bird. Unfortunately, the bird was done with birders for the day. Paul and I walked the big 2-mile loop in the mid-day head with hopes of finding either the cuckoo or a Black-whiskered Vireo. We had no luck with either bird, so I invited Paul to join me with Angel and Mariel the following morning. 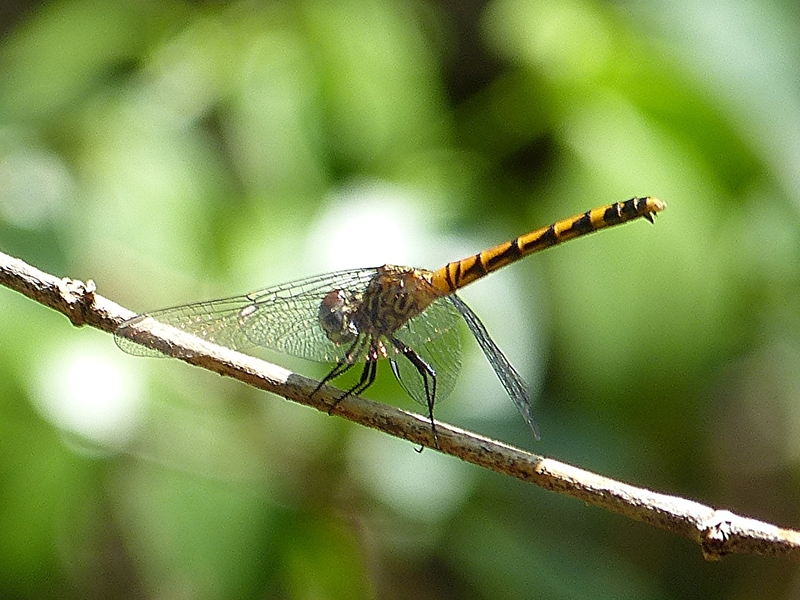 Seaside Dragonlet, a “lifer” dragonfly on the 2-mile walk at Dagny Johnson. Have you guessed what happened? Yep, we missed seeing the cuckoo the next day. We went to the location where it had been reliably seen for months. The cuckoo called, but refused to come out and show itself. Now I really understood how incredibly lucky I had been the previous day. Paul headed off to pick up his wife at the Ft. Lauderdale airport and Angel, Mariel, and I headed to El Mago de las Fritas for the best fritas in town. Mariel and I had ours with an egg on top of the meat patty. Yum! Red-whiskered Bulbul that I photographed in China. That afternoon, Angel and Mariel took me on a tour of Miami searching for established exotic avian species. Many of these birds are now ABA countable and they found every single one that I needed. That afternoon I added FIVE birds to my ABA list – Spot-breasted Oriole, Red-whiskered Bulbul, White-winged Parakeet, Muscovy Duck, and Egyptian Goose. 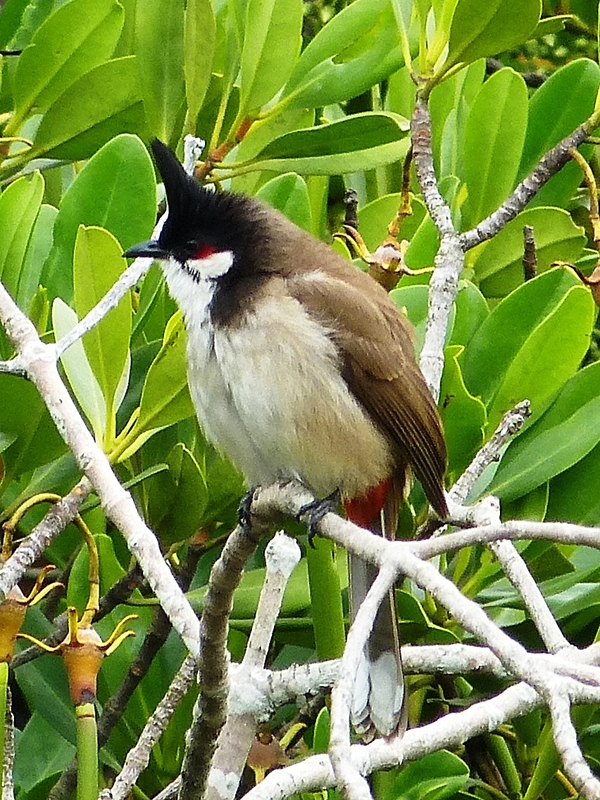 I had seen the Red-whiskered Bulbul many times in China and India, but I still learned something new from Angel. The red patch on the face really is whiskers, just as the bird’s name suggests. If you look closely, you can see the whiskers stand out from the face. Spot-breasted Oriole. Photo by Angel Abreu. Non-native species frequently create serious environmental problems, including pushing out native species. As far as I know, though, the exotic bird species in Miami have not created any problems. 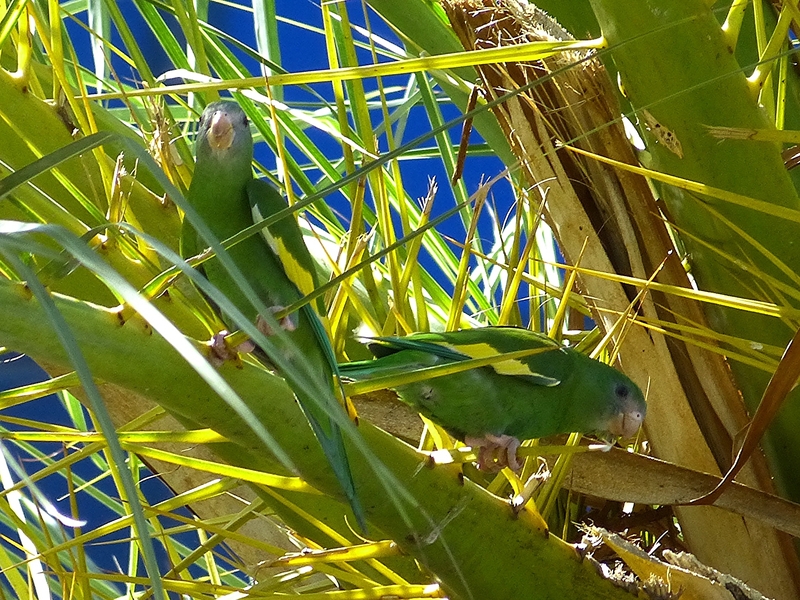 The parakeets, for example, seem to have found a unique niche not utilized by other birds, so there is no competition. 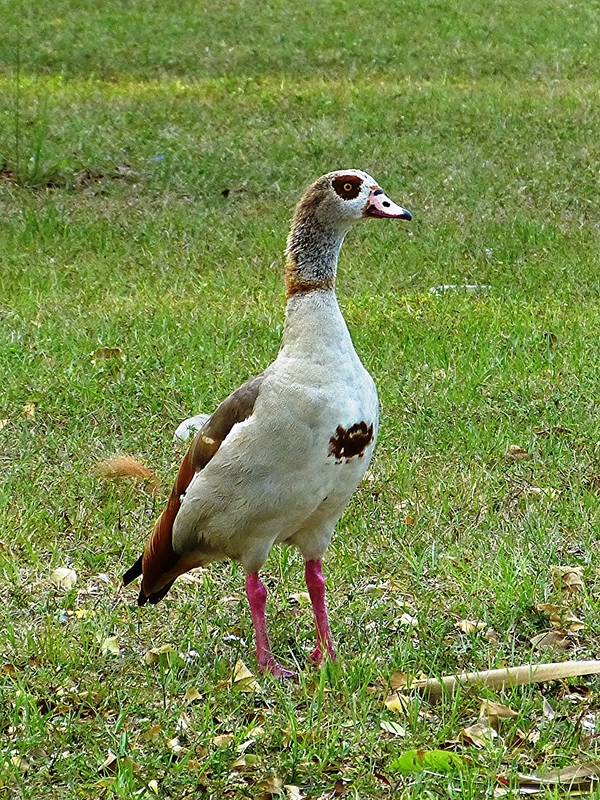 Mr. & Mrs. Egyptian Goose in the photos above. The male with the darker neck and breast spot is on the left. Below, they take their goslings for a swim. In addition to the exotic birds that we found, I also enjoyed my best ever looks at a native species, White-crowned Pigeon, which reaches the northernmost limit of its range in Miami. We finished the day near dusk with more exotic species, the not yet countable Orange-winded Parakeet and Common Hill Myna, and our first-of-the-season Common Nighthawk. It was a lovely end to a wonderful day. Angel and Mariel not only know where to find the birds, they are incredibly nice people and it was fun to spend a day with them. If you need a birding guide in South Florida, I highly recommend Nature is Awesome. I’d had some wonderful birding, but the trip was not yet over. Watch for Part 3. It was crazy to do this trip. I am going to Alaska in June and I had promised Myrna that I would visit her in California. I really didn’t need to cram in another spring trip. It all started when Kitty Jensen was telling me about her Everglades trip with the National Park Conservation Association. “I’ll just fly Allegiant to Punta Gorda,” she began. I interrupted with “No, you won’t. Allegiant no longer flies there from Greensboro. It would be easier for me to just drive you down.” As usual, I blurted this out without first engaging my brain. But, it would give me a chance to look for Mangrove Cuckoo and other South Florida specialties while Kitty was doing her Everglades trip. The cuckoo was a bird that I really wanted. I had been waiting for a chance to go to Florida in April since Jeff and I missed the cuckoo in 2011. So, when Myrna asked me to visit the first week in April, everything fell into place. Kitty and I decided to slowly drive down and back, with lots of stops along the way. We left late on the morning of April 9 and got to South Carolina in time for a quick spin through Savannah National Wildlife Refuge’s Laurel Hill Wildlife Drive before dark. The next morning we enjoyed the wildlife drive at Harris Neck NWR and then drove through the Osceola National Forest on our way to Gainesville, Florida, where we spent the night. On Saturday morning, we went to one of my favorite birding spots in Florida, Lake Panasoffkee Wildlife Management Area. On our way there, I listed all the birds that we could see – Loggerhead Shrike, American Kestrel, Eastern Meadowlark, Red-headed Woodpecker. For the first time that I visited the site, other birders were there. As we left, the group was assembled under the Kestrel nest box where a Florida Fish & Wildlife officer was speaking. We were sure that he was talking about the Southeastern subspecies of American Kestrel, which is threatened in Florida. 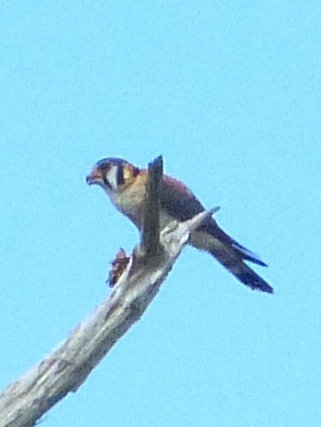 Just before we exited onto the main road, we saw a Kestrel perched in a tree on the other side of an open field. We had seen every single species that I’d mentioned, plus a Northern Bobwhite for a bonus! We finished the day by driving to Naples, where I dropped Kitty off for her Everglades trip. I continued on to Florida City, where I met a friend who lives in Florida. We had a great day on Sunday driving through the Florida Keys. 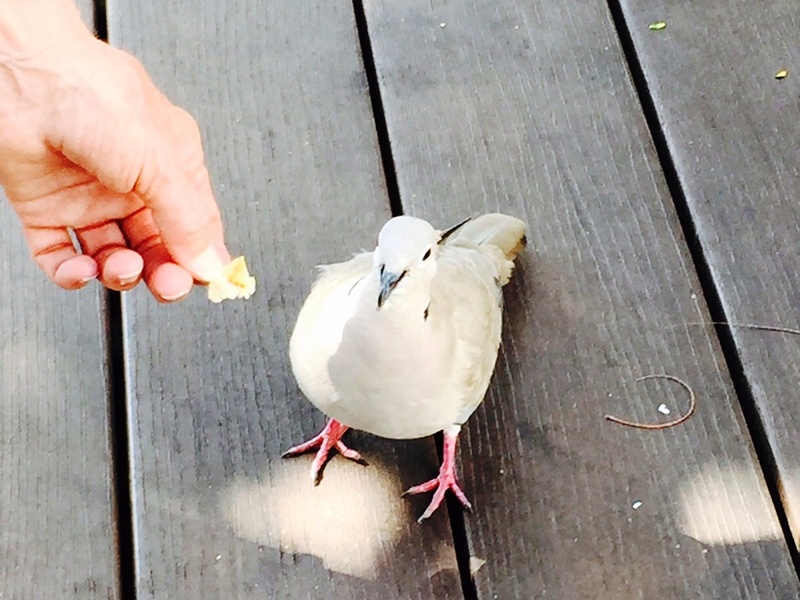 We didn’t have time for normal birding, so we enjoyed this very tame Eurasian Collared-Dove who pecked at bread crumbs right at our feet while we had lunch in Key West. We made time to look for Key Deer on our way back. 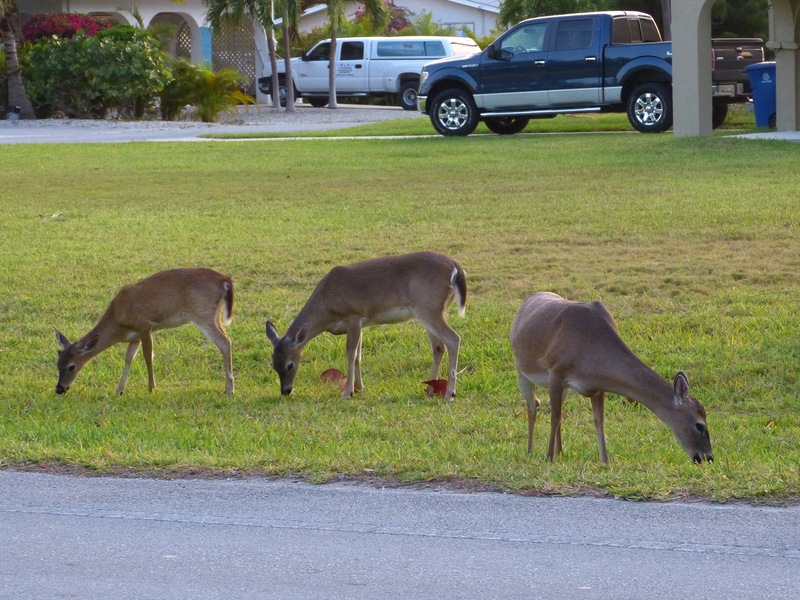 Feeding the deer is legally prohibited, but people must do it anyway as the deer are very tame. We spent the next day in the Everglades, slowly driving from Florida City to Flamingo. 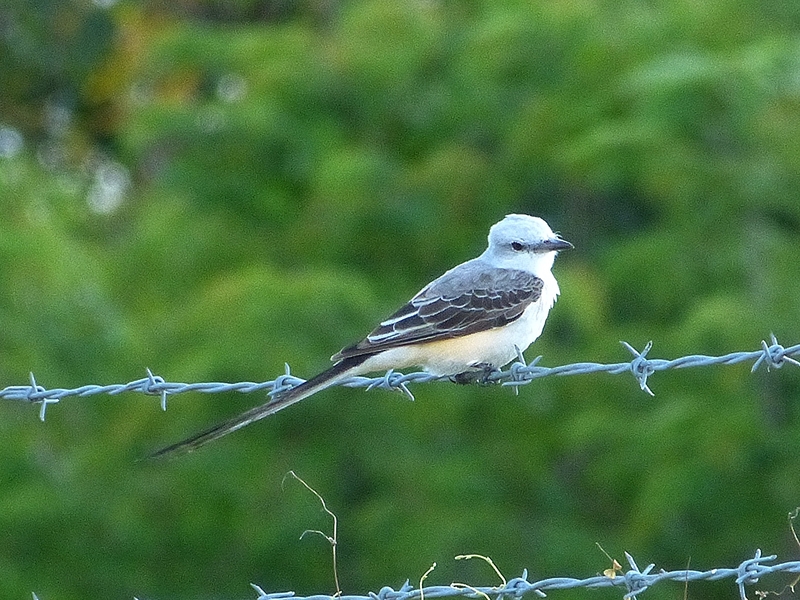 We started just outside the park entrance and found five Scissor-tailed Flycatchers. I think of the flycatcher as a Texas bird, but they frequently winter in Florida. 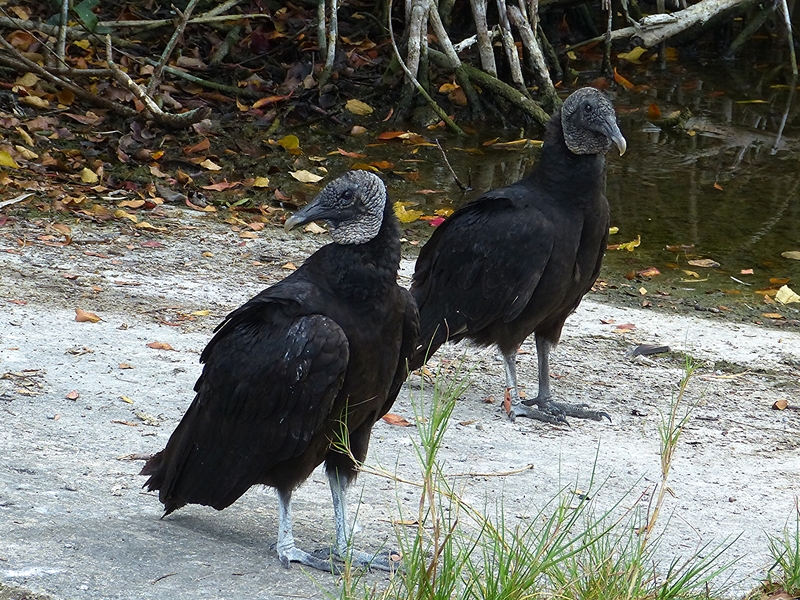 We always enjoy watching common birds and that day the Black Vultures held our attention. At Paurotis Pond, we watched this “couple” preen each other, or do what would have been preening if there had been any feather on their heads. They allowed us very close, but we backed off to give them some privacy. Before anything really exciting could happen with the vultures, a couple from Sweden pulled in. 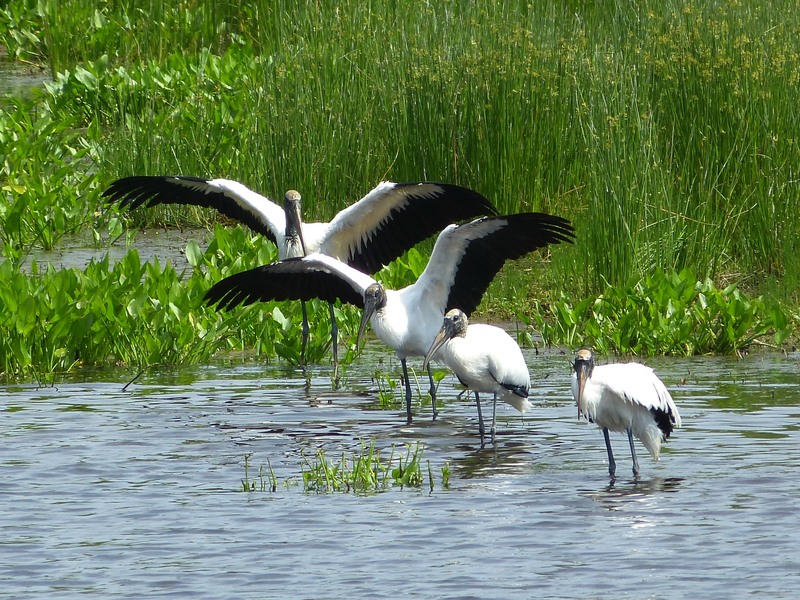 It was their first trip to Florida and they were looking for Roseate Spoonbills. We pointed out where the birds were and enjoyed chatting with them for a while. I’m sure that they would have found the birds without us, but they were very grateful for our help. Before they left, the man said, “I’ve got to give you something” and ran over to his car. He came back with a pen from the company that he works for and gave it to me. We continued our drive towards Flamingo enjoying the typical Everglades sights – Red-shouldered Hawks, Swallow-tailed Kites, Woodstorks. At Eco Pond, we found a flock of 26 Black-necked Stilts. 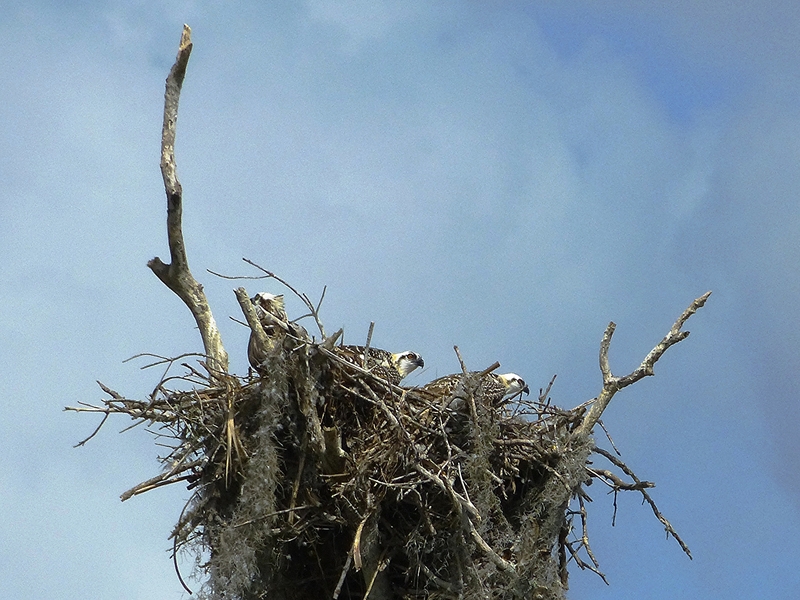 Near the amphitheater at the Flamingo Visitor Center, we found an Osprey nest with three large juveniles who looked like they were ready to fledge at any moment. 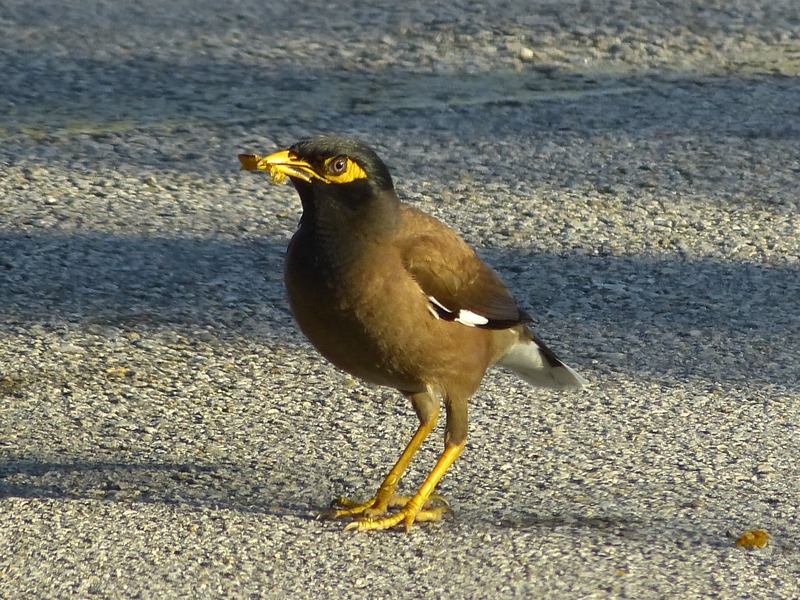 We returned to Florida City just before dark and easily found a Common Myna in its natural Florida City habitat – the drive-thru at Long John Silver’s! When my friend Myrna asked me to visit her in her new California home, of course I said “yes”. 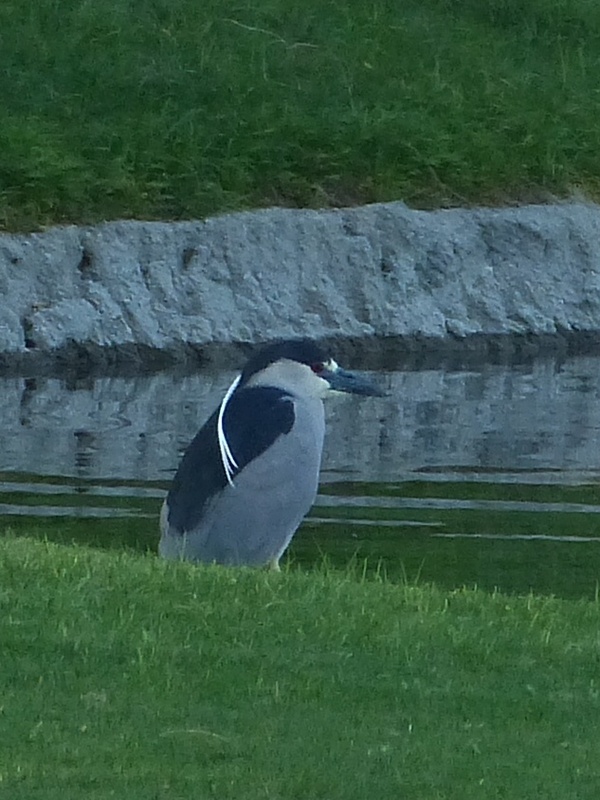 I had birded Southern California in April a couple of years ago, so I didn’t expect many new birds. It would be fun just to see Myrna and explore her new part of the country together. I flew to Palm Springs on March 31 and we checked out her Sun City Palm Desert neighborhood that afternoon. The lakes were still covered with ducks and coots. 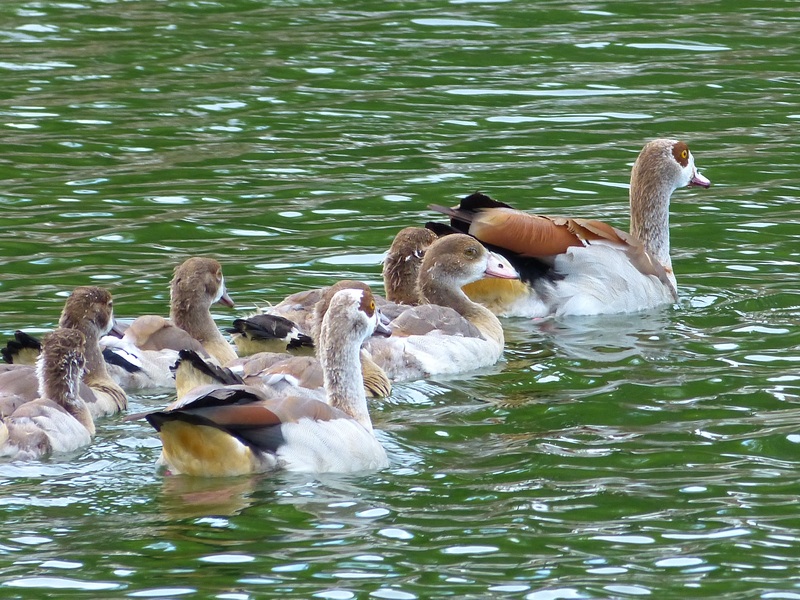 The ducks included American Wigeon, Ring-necked and Ruddy Ducks, Mallard, and a single male Red-breasted Merganser. Evidently, the merganser was a bit unusual for this location as it required quite a few emails messages with the eBird reviewer to convince him of our sighting. 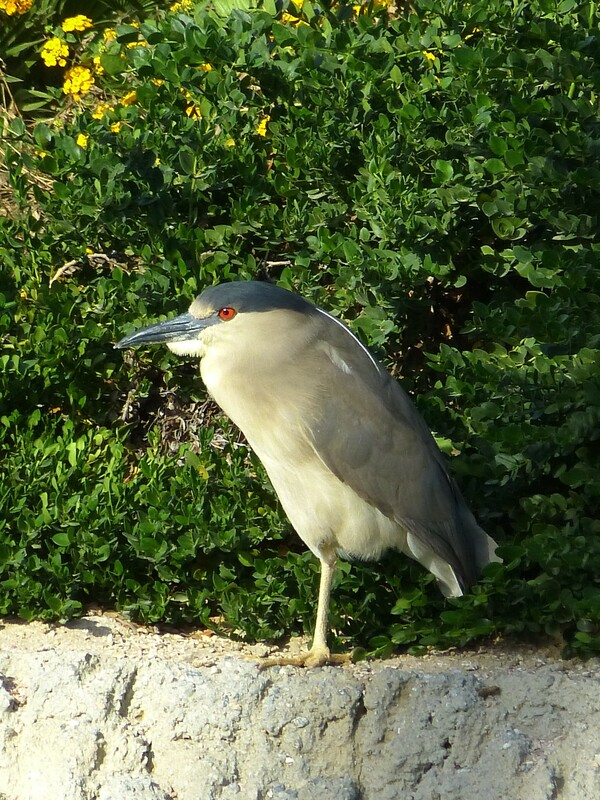 Myrna and I found the Black-crowned Night-Herons more interesting. First, we found this cooperative juvenile. A couple of days later, we found the first summer bird and the adult in the photos below. It’s a very common bird, but it was fun to compare the three different plumages. On our first full day, we went to Anza-Borrego Desert State Park . 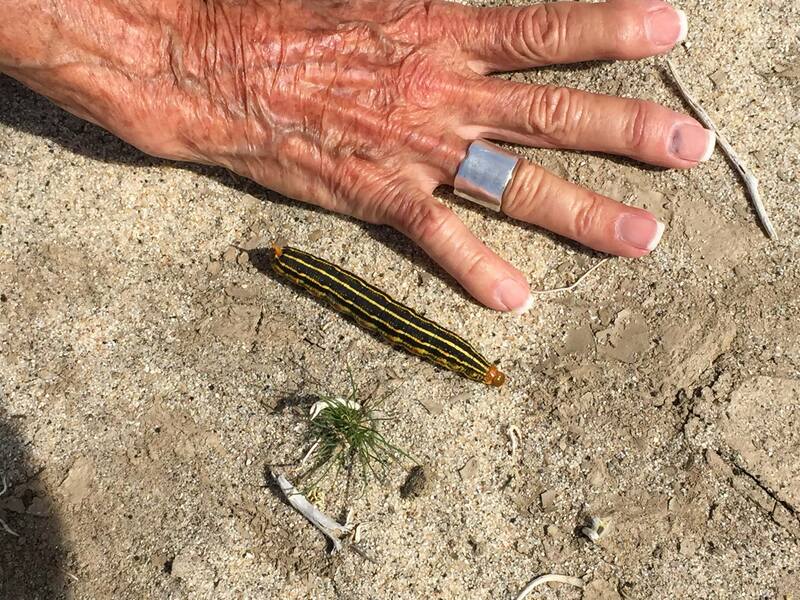 Myrna had been there two weeks before my visit and witnessed the spectacle of wildflowers, White-lined Sphinx Moth caterpillars, and hundreds of migrating Swainson’s Hawks feeding on the caterpillars. 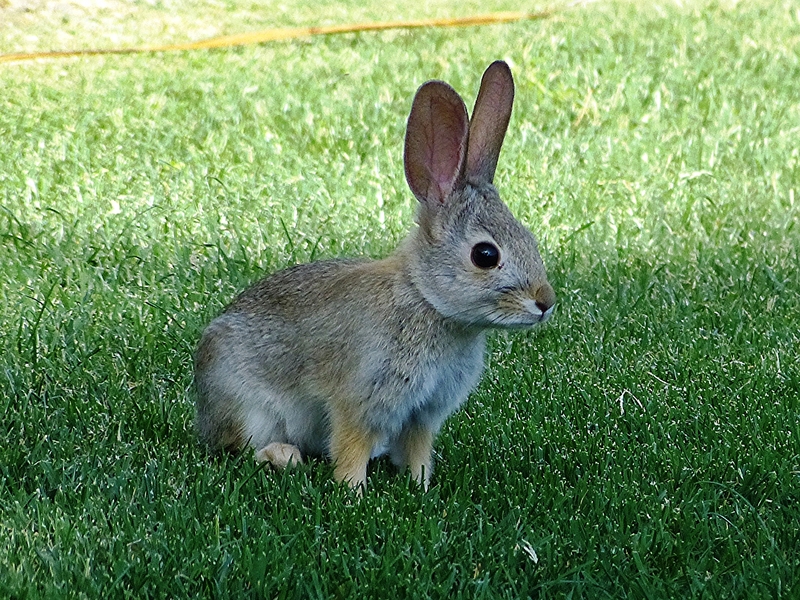 But, in the California desert, all life depends upon the unpredictable seasonal rains. Alas, there had not been recent rain when I arrived, so we saw no caterpillars nor Swainson’s Hawks and few wildflowers. Regardless, we had a wonderful day exploring the gorgeous desert. 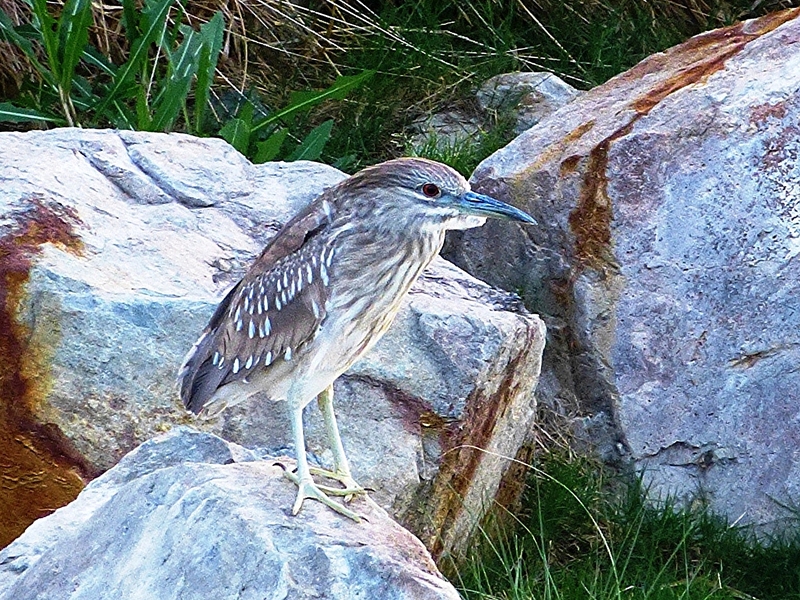 Our favorite birds that day were Rock Wrens. 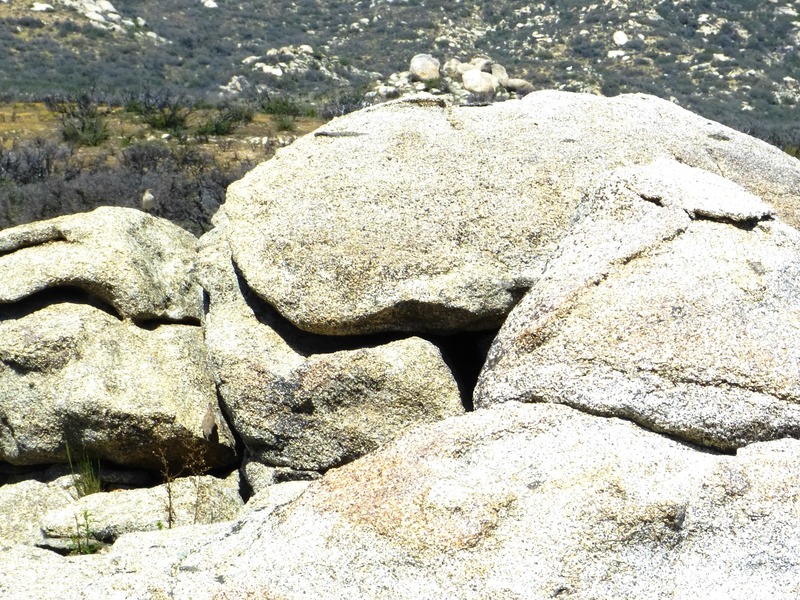 We’re pretty sure that they were building a nest in the crevice in these rocks. I had a very difficult time taking photographs in the bright desert sun, but if you look closely, you can see a wren on top of the left rock. In the same very dry desert area with the wrens, we also found a Black-throated Gray Warbler, Brewer’s Sparrows, and the ever-present White-crowned Sparrows. We walked the trail to Pena Spring, also dry desert, and found a Phainopepla, Cactus Wren, more Brewer’s Sparrows, and the most orange House Finch that either of us had ever seen. The Anza-Borrego Visitor Center is a little oasis where we were pleased to get great looks at Nashville, Orange-crowned, and Yellow-rumped Warblers. We took it easy the next day and stayed close to Myrna’s home. On Friday, we had another big day at San Jacinto Wildlife Area, a 19,000 acre site with 9,000 acres of restored wetlands. As expected, the water brings in the birds and this was the birdiest place that we visited. 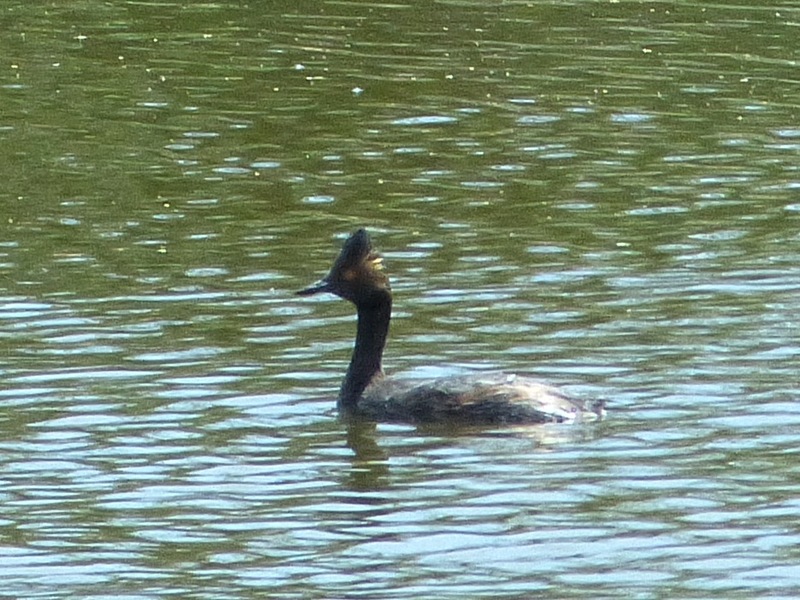 Most were common western birds, with Eared Grebe in breeding plumage a highlight. 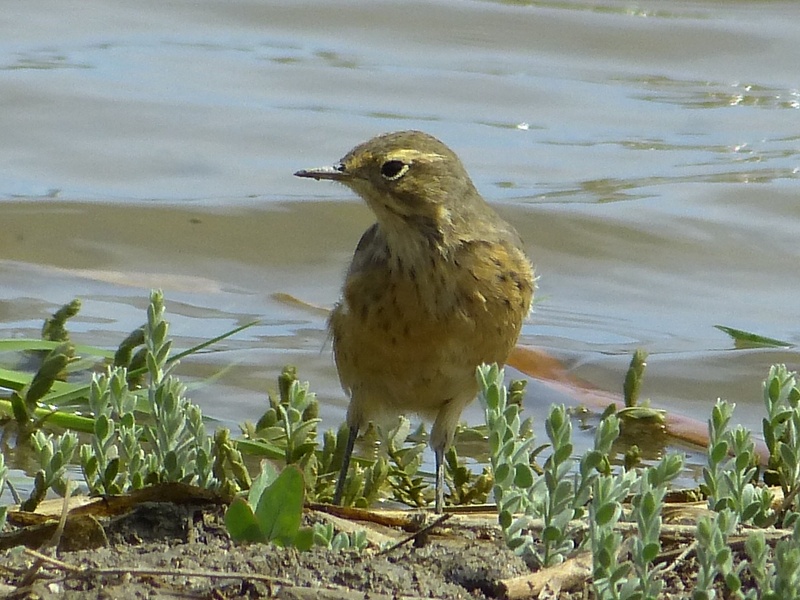 We also enjoyed close looks at a very cooperative American Pipit. 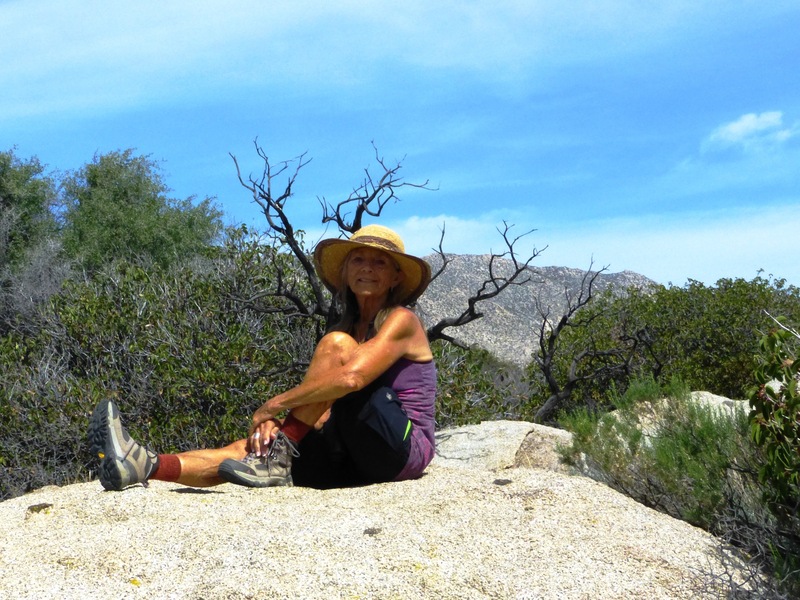 Myrna saved the best for last and on Saturday we visited Big Morongo Canyon Preserve and Covington Park. These parks consist of both desert and woods, but most of the birds that we saw were in the wooded areas. A pair of Vermillion Flycatchers thrilled all the birders in the park that day. We were just as happy to see a pair of Phainopeplas cavorting in the trees. Lesser and Lawrence’s Goldfinches presented themselves for comparison as well as Hooded and Bullock’s Orioles. Three species of hummingbirds charmed us – Costa’s, Anna’s, and Black-chinned. These parks are also home to both Ladder-backed and Nuttall’s Woodpeckers and we were told that many of the birds there were hybrids. And, here, we finally got our Swainson’s Hawk. Phainopepla pair. Photo by Larry Noelker. Back at Myrna’s, most of the ducks and coots had left, but the Verdins and White-crowned Sparrows in Myrna’s yard were a constant delight. 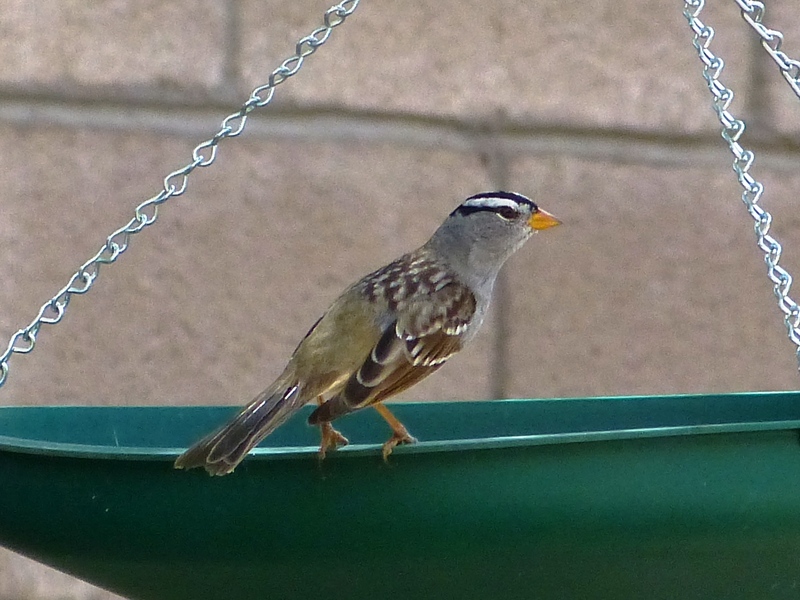 These White-crowned Sparrows are the Gambel’s subspecies, different from the birds that we normally see in the east. Note the pale lores on Myrna’s bird. 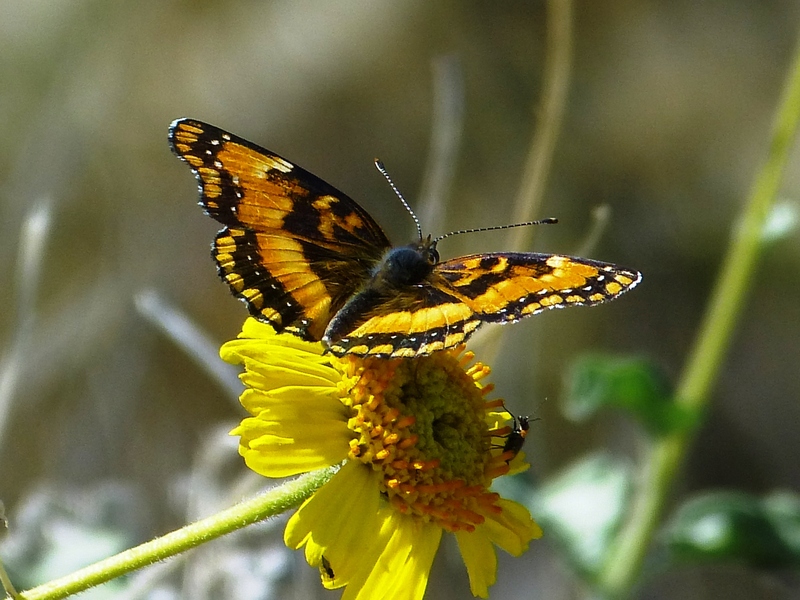 In four and a half days, we had seen 85 species of birds and Southern California habitat ranging from desert to oasis to mountain forest to wetlands. Myrna and I had a wonderful visit and fun exploring this beautiful part of the country that she now calls home.